9 A.M. Start on Main Street for 10k and 5k. 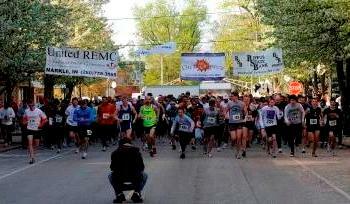 9:05 A.M Start on Main Street for the one mile event. Chip timing for each participant. Benefiting the Roanoke Lions Club plus the organizations and projects that the Lions Club supports. All 10k and 5k participants registered By April 1st will receive a long sleeve event shirt at check-in. Shirts will only be available to participants registered AFTER April 1st as supplies last. Shirts will be available for purchase by one mile participants for $10 as supplies last. 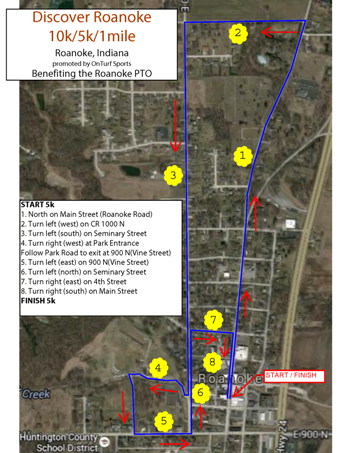 Early Packet Pickup for pre-registered runners and walkers and on-site registration available the Friday before the race at Roanoke Community Center, Main Street, Roanoke, Indiana from 6 PM until 7 PM. 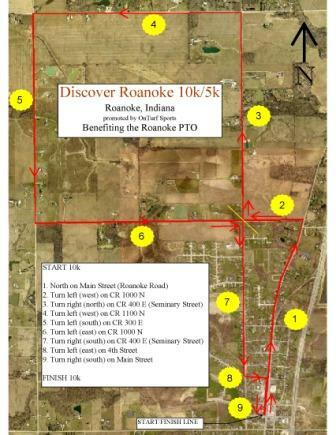 $17 entry fee for 10k and 5k or $7 for one mile if received by April 1. 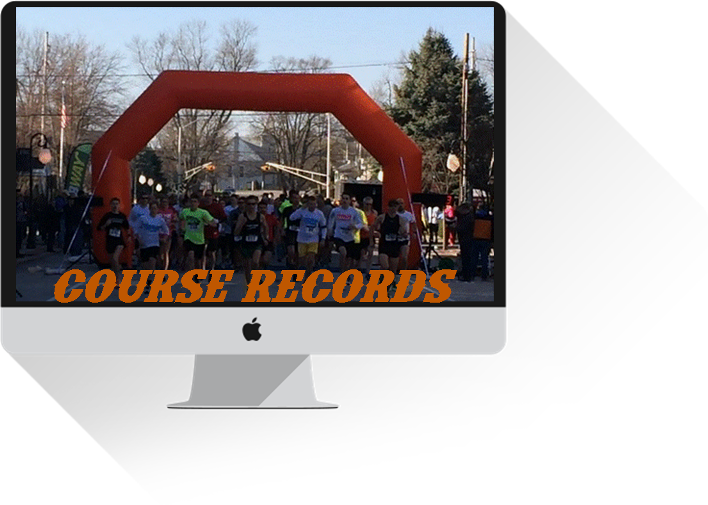 After April 1 and until online registration closes on April 11 at 9 PM, the entry fee will be $22 for 10k and 5k. Entry will be closed at 8:30 A.M. on the day of the race. Registrations are NOT accepted by phone or by fax. Only one participant per application. The application may be photocopied. All participants MUST finish within the time limit established for each event. 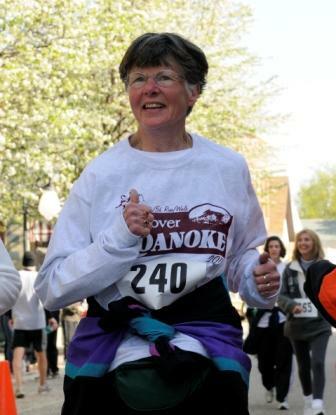 The Discover Roanoke race officials have the right to disqualify or remove any participant from the course whose activity violates any condition set forth or who poses any potential harm to himself/herself or any other participant. All participants are required to wear the bib number that has been assigned to them. 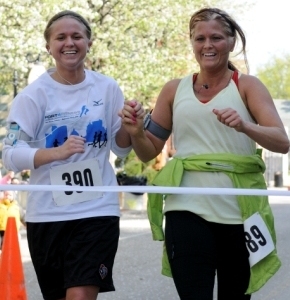 Participants without a visible bib number will be removed from the course. 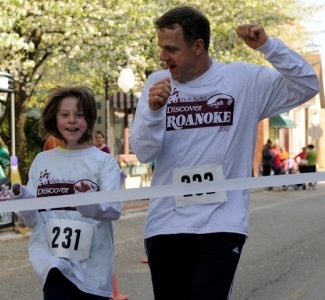 The Discover Roanoke 5k time limit is one hour fifteen minutes (2.5 mph pace). The 10k time limit is two and half hours (2.5 mph pace). 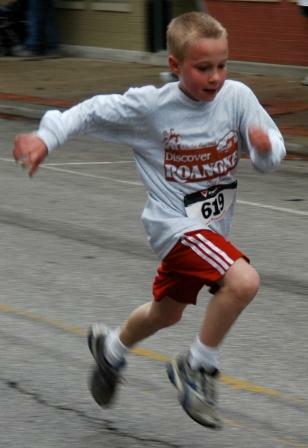 The Discover Roanoke race officials ask that participants do not wear headphones, ipods or similiar devices in the interest of safety. In case of an emergency, race officials will need to communicate with participants. Chip timing will be used for each participant. Chips will be returned at the end of the race. A clock display will also be available for spectators. 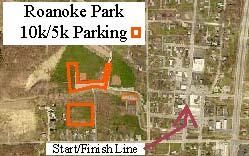 Free parking will be available at the Roanoke Park. 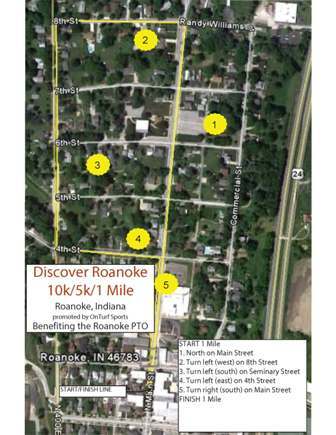 Main Street in the Town of Roanoke will be closed to vehicular traffic between 1st and 2nd Streets between the hours of 6 A.M. and 1 P.M. on the Saturday of the race. Vehicles left in this area must be removed by 6 A.M. on the Saturday of the race or they will be removed at the owner's expense. Pedestrians will still be able to access the businesses on Main Street during the closure time period. Please note: Overall Champion will not be the age group winner.